I was under the front end of my 70 Challenger and noticed that the front rubber bumpers seem to be making contact to the bump stops. 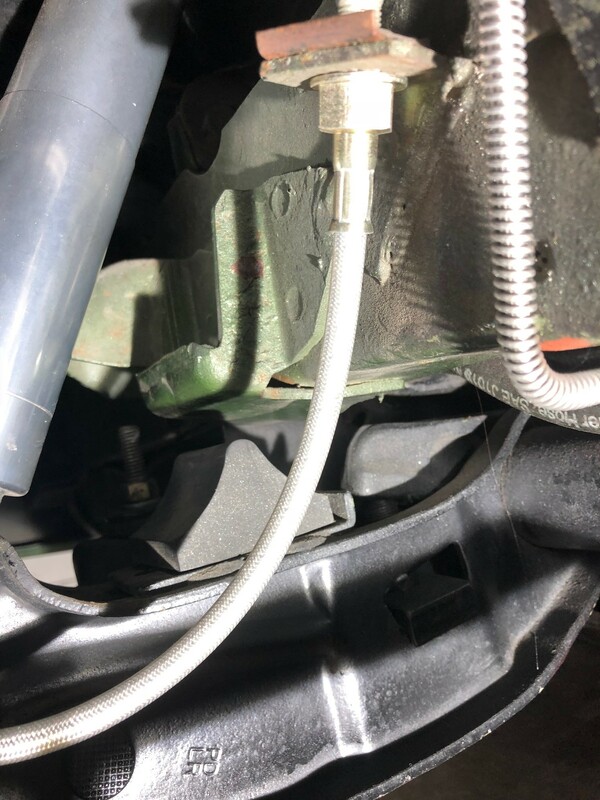 This one is the drivers side and it appears that the rubber bumper is wiping the dirt off of the bracket. The bottom of that bracket is shiny paint like it is being wiped off. If this is the correct guess, it it caused when backing down my drive and transitioning onto the street. I have 245/60/15's up front and from the ground to the top of the wheel trim is 24-9/16". Does this seem too low? Do I need to crank up the torsion bars to minimize this? Note: stock 340 torsion bars. That's not how you measure ride height. You can buy thinner bumpstops. Post a pic of the car from both sides so the ride height can be evaluated. Every car is different. Take the bumpers off the control arm to trim at least 3/8 of an inch off the end. Last edited by Dilbert; 08/16/18 08:41 AM. The passenger side is 1/16” lower at the wheel lip. Really? No [censored]? It's 2018? I suppose sundials are blase as well? What's the ride height spec for the fender lip? Do it the factory way, that ensure proper travel anything else is hack and don't take advice from hacks. YOU need to get out of the sundial age! The factory way and spec is irrelevant to most. He has different tires, shocks, springs from stock. Fender lip will still measure the difference. And it gives and idea of the visual look. Run a slightly shorter bumpstop. Last edited by autoxcuda; 08/16/18 01:23 PM. Are you seriously saying that the body tolerances, which are loose at the best of times, is more accurate? I don't think so. How many times have we seen the same wheel and tire combo rub at lock on one side but not the other? Or fit one 70 Challenger fine, but rub all over the place on another? I also did not say to set the ride height to factory specs. I said to measure it like the factory says to. Then you have a baseline. Once you decide where you want your ride height and have that baseline then maybe you can them measure some point on the body as quicky check point. 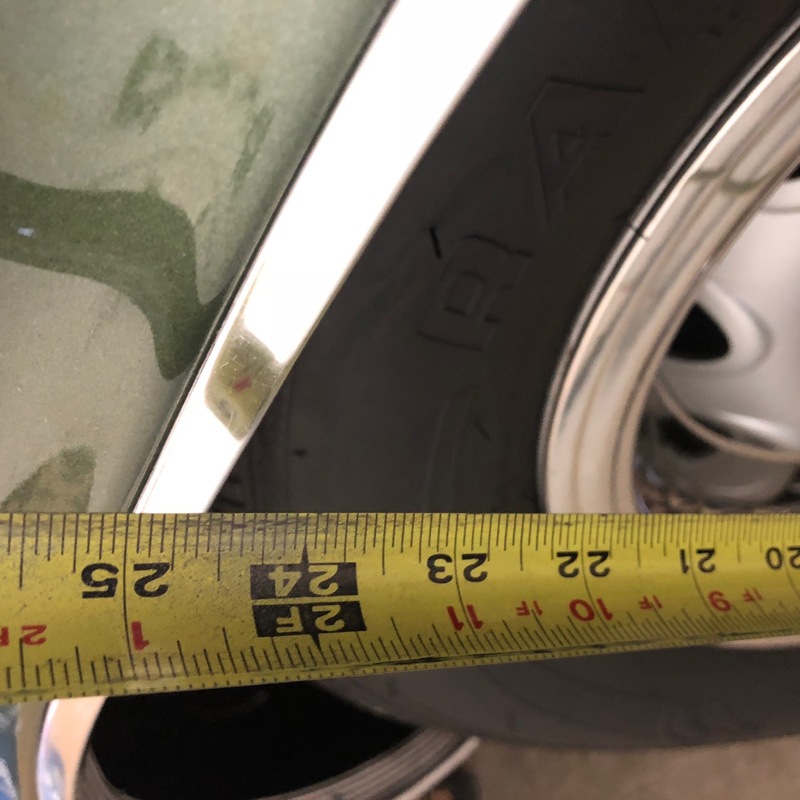 I can almost guarantee if you take three different 70 Challengers, set the ride height the factory way so that they are all identical as measured at the factory points then measure the same point on the body of each to "check ride height" you will have three different numbers. But if a "visual look" is all you care about this is the wrong forum. I'd remove the bump stop and trim it at least 1/2 of its original height. Further, consider stiffer torsion bars so to reduce the amount of front end dive. I have a little more space between the frame and the bump stop than the OP. 1-1/8" difference measured from the bottom of the TB adjuster blade and the bottom of the balljoint body if I remember correctly. 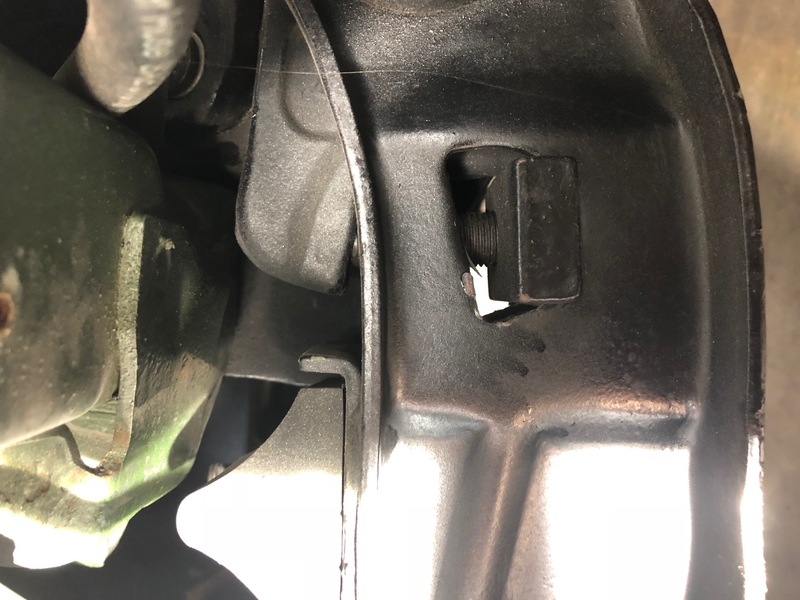 looks like the TB adjuster is already screwed in pretty far...depending on the purpose of the car, maybe it's time to bump the TB thickness up a bit, especially if you want the front pretty low. is that bump stop designed to be a slightly progressive stop? perhaps a small amount of contact there is ok. I would be more concerned about that fuel hose being near a moving suspension part. But you're worried about a little clean shiny paint on a limiter? You only need to worry when the bumper is squashed and deformed, and is tearing loose from the LCA. That rubber line is a trans cooler return line. That picture makes it look a lot closer than it really is. Your point made me go out and double check it but it is about 1-1/2" away from that control arm. You made a strong point so I got out my manual and looked up the spec. 1-3/16" (+/- 1/8") from A to B. I checked both sides and they are actually within the 1-3/16" tolerance range. Since the ride height is within spec and each fender lip to the floor is within 1/16" of each other and I like the current stance, I don't think I will be making any changes right now. The shiny paint appears to be telling me that my old 340 bars need replacing. I started another thread back in the Spring about replacing these bars and I have a good idea what I will be choosing. But I need to wait until the Winter for the swap. Not sure how hard you're driving the car but if you are hitting the bump stops while cornering you can really mess things up. You either need to raise the ride height or cut down the bump stop. 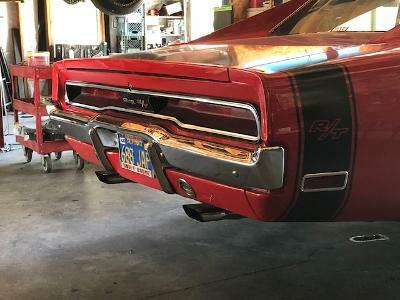 Lowered Mopars don't have much suspension travel left which is why they sometimes hit the wall. That is what happened to Eberg's car last time it was raced. Ran out of suspension travel and boom. We fought that with Tim's Valiant also. Last edited by AndyF; 08/17/18 03:10 AM. I don't drive the car hard at all in corners. The only time that I can think of is when I pull up/down my drive when the surface transitions onto the street. This car is not lowered on purpose, it is just setting at the height that the alignment shop set it. Is there a way to tell if I turn the adjusters too much? I may just try a few more turns to each adjuster to see how it feels. That 1/2" play at the bumper translates to a (guestimated) 2+" of movement at the wheel. Daily driving with 1" torsionbars in my Dart gives a nice and well behaving setup for me. But with some spirited streetdriving I feel the car would benefit from more springrate. Oh, my bumpstops bailed ship long ago but the setup is firm enough to prevent contact. I was going to leave it alone but I could not resist. I made a few adjustments today just to see how the car rode with tightening up the torsion bars. I was surprised how much better the car felt. Before the ride was "squishy" going down the road but after a few adjustments the car feels more solid now. I thought it was odd that I could add 1/2 turn with little height change. Then 1/4 of a turn at a time started making bigger changes to the height. I assume this meant that the bars were under loaded. I am going to recheck the A versus B dimensions again to see if it fell out of te factory tolerance. But I like the feel of the car now. I can now see why going up on bar size would be good for handling. I am keeping track of my dimensions so I can match the height after I change bars this Winter. Then off to the alignment shop next Spring. Note: the bars are the stock 340 .92" bars. Changing the ride height has no effect on spring rate. What you are doing is just like putting the front tire under a block. When you push down in your bumper there is the same resistance whether on a block or not. Now you put a 3” block on top of that spring. When you stand on it it will still go down 1”. And the spring rate is still 200 lbs/in.